Deer Meadow drapery panels have a 3" rod pocket and 1.5" header. These rustic drapery panels are a beautiful addition to any room in your rustic home. 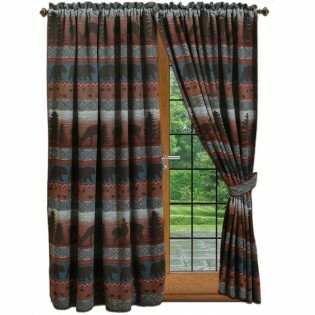 This pair of Deer Meadow drapery panels have a 3" rod pocket and 1.5" header. These rustic drapery panels are a beautiful addition to any room in your rustic home. Each panel measures 60" W x 84" L.